Objectives : 1. To enhance the resilience of Indian agriculture covering crops, livestock and fisheries to climatic variability and climate change through development and application of improved production and Risk management technologies. 2. To demonstrate site specific technology packages on farmers’ fields for adapting to current climate risks. Climate change and agriculture are interrelated processes. Global warming is projected to have significant impact on conditions affecting agriculture, including temperature, carbon dioxide, glacial run-off, precipitation and the interaction of these elements .These conditions determine the carrying capacity of the biosphere to produce enough food for the human population and domesticated animals. Models generally predict that rising temperature, increased climate variability and extreme weather events could significantly impact food production in coming decades impacting growth of agriculture GDP. Assessment of the effects of global climate changes on agricultural might help to properly anticipate and adapt farming to maximize agricultural production. It is therefore most important that we enhance the resilience of Indian Agriculture production system to climate variability and climate change. Resilience is the capacity of the production system to resist the negative impacts of climate change and also the capacity to recover quickly after the damage. 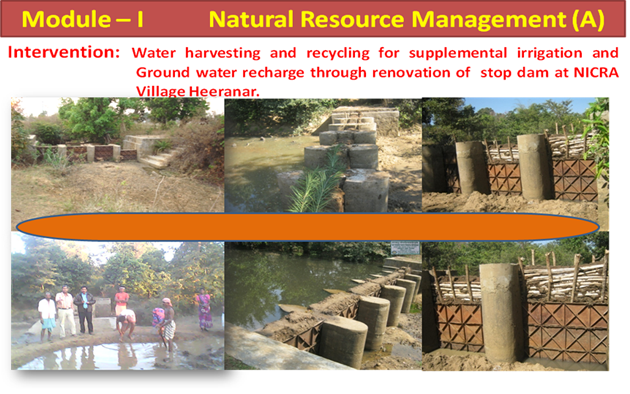 The NICRA project is an integrated package of proven technology which is demonstrated in Heeranar village of district Dantewada for adaptation and mitigation of the crop and livestock production systems to climate variability based on the available technologies. Demonstration of this technology is also given to other farmers from different village of Dantewada district. 1. Training programme, Kisan Gosthi, Field Day, Diagnostic visit under National initiative on climate Resilience Agriculture. Year No. of Training No. of Part. No. of Kisan Gosthi No. of Part. Awareness camp No. of Part. Exposure Visit No. of Part.